Heat oven to 350°F. Spray 13x9-inch (3-quart) glass baking dish with cooking spray. Cook linguine as directed on package. Meanwhile, in 2-quart saucepan, melt 3 tablespoons butter over medium heat. Stir in flour and lemon-pepper seasoning. Stir in broth; heat to boiling, stirring constantly. 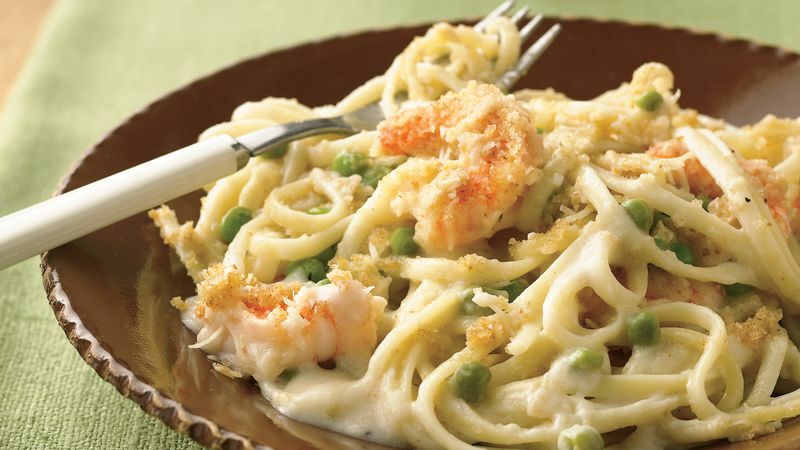 Stir in half-and-half, sherry, shrimp and peas. Drain linguine; place in 13x9-inch (3-quart) glass baking dish. Pour sauce over linguine; toss to mix. In small bowl, mix 2 tablespoons melted butter and the bread crumbs. Sprinkle over shrimp mixture. Sprinkle with cheese. Bake about 30 minutes or until mixture is hot and topping is golden brown. Spaghetti can be used in place of the linguine. Fresh mushrooms would make a nice addition to this recipe.